Does InMotion accept payments through PayPal? A lot of people may actually think than InMotion does not accept payments through PayPal. The reason for this wrong idea is that unlike other hosting companies where you are automatically given the choice whether you want your bill payments through credit card or PayPal during the registration process, the PayPal option can never be found in the Billing Section during the registration process. The Paypal option being not visible in the check out page has prompted a lot of people to think that InMotion does not accept payments via PayPal. However, nothing is farther than the truth. The truth is that InMotion does accept payments via PayPal although the option has remained invisible in their checkout page. A few years back, that idea would have been through but InMotion started accepting payments via PayPal since early 2013 but has not made the option public, so far. How can I pay InMotion via PayPal? On the next page, you will be told whether the domain name is still available or not. Click the “Continue” tab on the bottom right corner. Clicking the “Continue” button will bring you to the Billing Page. You need to provide all the required information on the boxes provided. On the bottom part of the page is the Payment Information box sub-header. Choose the “Purchase Order or Check” option. Once information entry is complete, put a check mark on the “I Agree” under the Agreement sub-header and then click “Purchase Account”. It is important that you click the tab only once as click it a number of times may signify the number of times you wish to purchase it. After clicking the “Purchase Account” tab, contact InMotion Hosting sales support either via live chat or toll-free phone 888-321-4678 and the ask the representative that you prefer to place the payment via Paypal. You will then receive a payment link via e-mail in just a matter of minutes. What are the benefits of paying InMotion via PayPal? Paypal is among the quickest, most secure and the easiest way to pay your bills. Paypal is so flexible that it even allows you to use your credit to pay through Paypal, aside from your bank account and debit card. You can use it to send and receive international payments and transactions. You can hide your credit card information when you use Paypal. The company allows you to keep track of all your transactions online. Why is PayPal not included in the InMotion payment options? The reason why PayPal is not included in the InMotion payment options is cost savings. You see, although PayPal requires no membership fees, it does charge 4% of the total bill while credit card companies only charge between 0.5% to 1%. This means that InMotion saves up to $5 per bill if clients use credit or debit card. 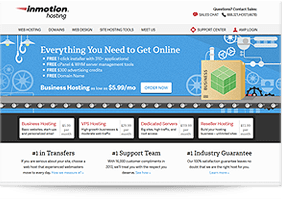 The amount saving the InMotion gets is invested on their web hosting infrastructure and customer service to a better web hosting service.